Strange things happen to each of us from time to time and I had one of them happen to me recently. Something that evidently others knew but it has eluded me all these years. It turns out that I was just desperate enough to try anything that would work, so I tried it, and it worked. In this post, I call it a pimple so it is easier for everyone to understand. It was actually what is called a “Skin Tag”. Maybe some of y’all already know all about them. After I got a few of them, I looked up what they are called. I never heard them called that before and it was easier and less confusing to others to just call them pimples. I have 3 or 4 of them on me, but this one was in a bad spot and it seemed to be getting larger and more irritating as time went on. Besides, “Pimple Choker” seemed like a good name for the title of a post. Something that would get everyone’s attention. I had one on the right side of my right thigh that bothered me whenever I sat down. I couldn’t go without ever sitting down again, so I tried the suggestion made by one of my Filipino cousins. She said that I should tie a strand of human hair around it. That seemed ridiculous to me, but I figured I had nothing to lose by trying it and I had to get rid of that thing. Also, it’s free and I’m all into saving money if I can. Lita wrapped it around there for me. I waited for a few days and noticed that the pimple seemed to be drying up. The hair seemed to be choking it. After 6 or 7 days, I was able to simply pull it out. No pain, no problems. That is something I would consider an old wives tale and didn’t really think it would work. Like I said though, I was desperate and willing to try anything at that point. I’m glad I decided to give it a try. I looked on the internet for this procedure and there it was. It was even the very first reference on the page when I did a search in Yahoo for “How to get rid of Skin Tags”. I also looked on YouTube and found a few procedures for getting rid of them. One of those procedures included putting toothpaste on it. Also weird. I didn’t watch the video, but supposedly it will take care of the problem overnight. https://www.youtube.com/watch?v=XJsAfaabLtE. Has anyone else heard of doing this? 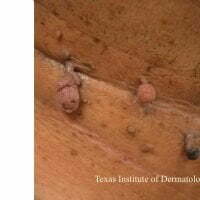 Do you have other ways to get rid of skin tags or pimples? I’d like to hear about other procedures that you may have. I’ll bet there are a lot of home remedies that people use for such things. Here are a few videos I found on YouTube for this. I didn’t see any that involved human hair, but other similar things work also, like dental floss. I always get these darn skin tags mostly on my neck area. never bother me but hose that do I started by just wiping the area down with alcohol, then used a pair of super sharp surgical scissors and cut them off. Wipe down again with alcohol and put some antibiotic cream or ointment on the area and cover with a band aid for about 3 or 4 days. They’ve never come back and my method although not that any DR would approve of always works for me. If that’s how you want to get rid of them and it’s working for you, go for it. I wouldn’t do that. The hair thing takes about a week, but it is totally painless and works great. I had a few removed by a physician back in the states (when I had insurance, lol). I have a couple of others. Maybe I’ll try the hair or dental floss method. Sounds relatively painless. Let you know how it goes. I had some burned off in the US. The hair thing was painless and it worked great. No after effects and no return of the problem.